Italian prog legends Banco del Mutuo Soccorso have released a promo video for their new single L'assalto dei lupi. 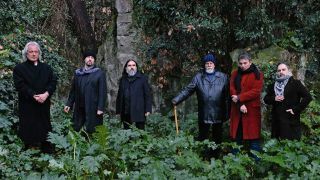 It's the second single to be taken from the band's brand new album, Transiberiana, their first new release for 25 years. "The lyrics of L’assalto dei lupi express the ferocity of the wolf pack, that is the cowardice of those individuals who force themselves with the strength of others to lash out against those who are different from them," explains founding member and keyboard player Vittorio Nocenzi, who co-wrote L’assalto dei lupi with son Michaelangelo. "The mediocre who are jealous of excellence, the envious, the intolerant, the violent in general. The polyrhythm of the arrangement creates an urgent general rhythm pattern up to paroxysm." Transiberiana will be available as Limited Edition Mediabook CD with 44 page booklet, Gatefold 2LP + CD + LP Booklet, and as digital download. Pre-orders are available from the band's website.